I've had a pair of ice skates for as long as I can remember. No, I do not ice skate. 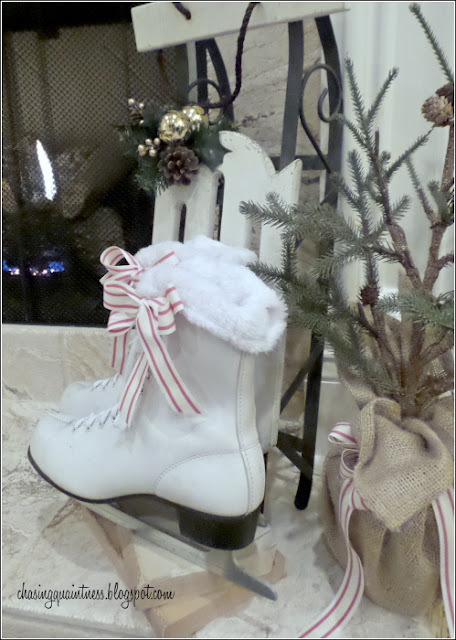 I found these cute skates at the thrift store and have used them in my Christmas decor over the years, usually paired with some sort of sled. They normally go outside, but last year I pulled them inside and decided to do the same again this year. 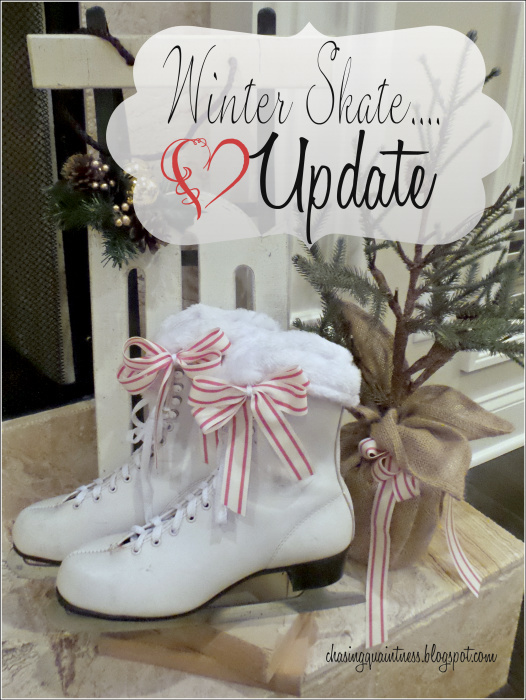 While these skates are in great shape and are cute, they lacked curb appeal. So, while wandering around in the store looking for some filler decorations, I decided I would do something to give the skates a little oomph. I had a vision. 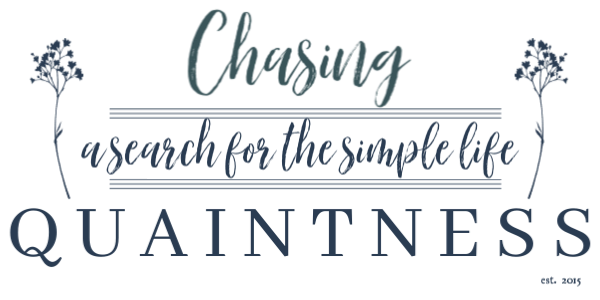 Now I know that my visions have gotten me into trouble in the past, but this one was one I knew would work AND would be super simple to do. I headed over to the dollar store to purchase the following items. ...and tucked the collars down inside of each skate to make the fur top. I had some ribbon left from last year and made a bow for each skate. I added the two sprigs of greenery to the stop of the sled. These small changes totally transformed the look of the skates. They were dull and boring, and now, they are cute and wintery....like unused ice skates should be! After the holidays, I can remove the two sprigs of greenery from the sled, add a different color bow and have winter decor on my fireplace hearth. 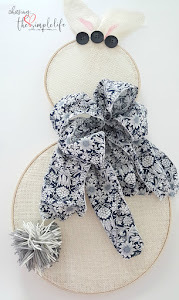 Not only do I now have something with some visual appeal for the holidays, this little set will carry me through the winter months with just a small change or two. 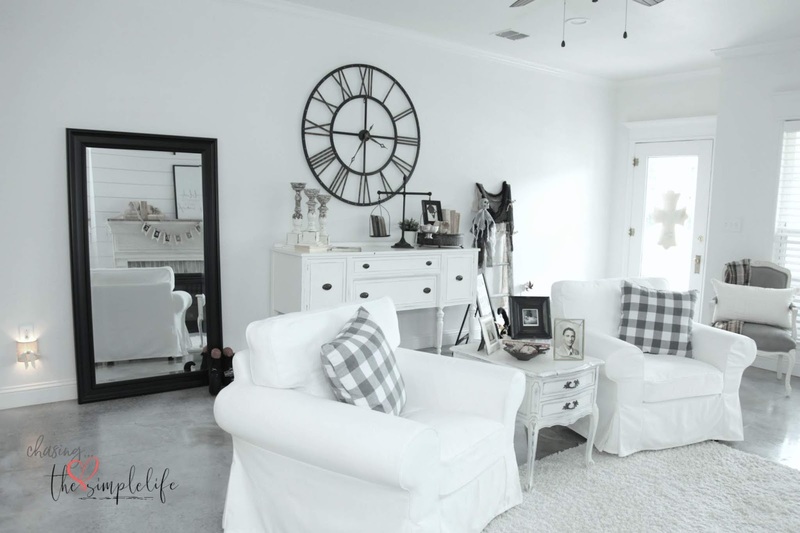 I don't know about you, but I like simple and easy in my decorating projects! "Connie, I think Carl is just about one of the nicest fellows I could ever hope to meet, but I think you ought to marry me." you made those skates adorable. If I lived where people ice skate, I would do that to my skates I wore out on the ice. So incredibly cute. No clue on the quote. Wrong movie! ;-) Christmas...not horror! holiday affair. with robert mitchum. YAY...that is right!! I love this movie....and Robert Mitchum. Even though he did get into some trouble, he was a great actor! I never could ice skate, I just like the thought of being able to glide across the ice and not fall on my face...or rear! :-) Thank you ma'am!! Love and hugs!! Well you've got me totally stumped on that movie quote, Benita!! The skates, on the other hand? I would absolutely wear those out on the ice just the way they are now!!! Thank you so much...I think they look much, much better! The movie is Holiday Affair with Janet Leigh and Robert Mitchum...great old b/w movie! The skates are just adorable. Love!!! Thank you so much Kris! A little bit of fur always adds something special! Hope you are having a great one also…hugs!! A Holiday Affair pearl of wisdom still applicable today Connie Ennis: "If you wish for things you can get, you're gonna be happy. If you wish for real big things, all you're gonna get is real big disappointments." Love what you did wit the skates – I have too much Christmas stuff I use mine as a winter decoration to brighten things up after Christmas – only mine are vintage metal clamp on ones with hearts where the sole of the boot fits that allows me to carry it over as as V’day decoration too – I love multi season/holiday decorations! 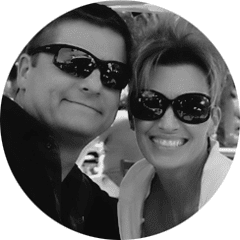 You have been very crafty lately Benita-great update! I know, right?!! I'm so glad they turned out as well as they did and that I'm not covered in fur or gold paint from these last two projects. :-) Thank you so much! Hugs!! Adorable skates and I love how creative you are with cutting the tops of the stockings off! You've inspired me to doll up my boring ice skates. Mine are actually from my childhood when I did ice skate! Not trying that now with two new hips! You reminded me that I have to get my sled out too! I have always wanted to learn how to ice skate, but have heard that it is pretty difficult. Since I’ve never had a broken bone, I do not want to tempt fate…LOL I don’t know why I waited to so long to fix up these skates…I’ve had them forever and they’ve just been plain and boring. I do love that the skates you have are your very own…that makes them so extra special! Two new hips???!! Woman, what did you do?? Love the skate idea! 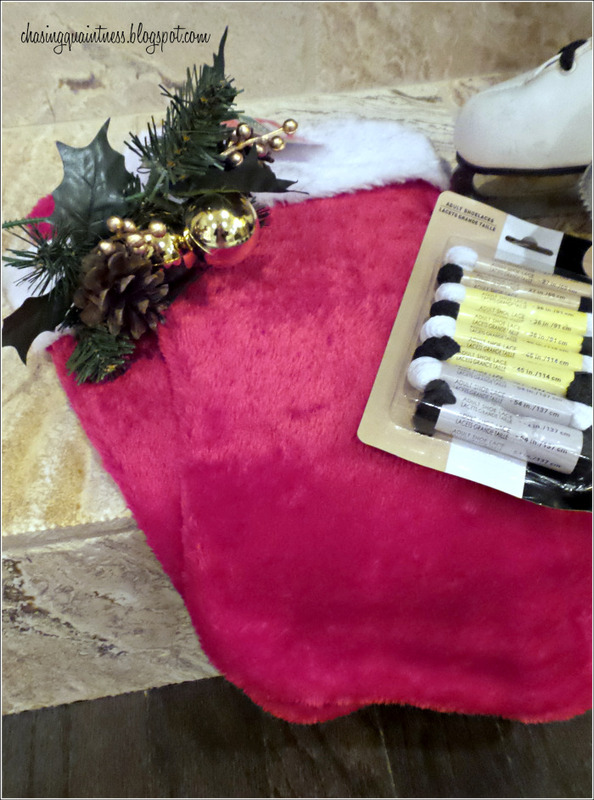 I never would have thought of the stockings. Thank You! So, so cute! 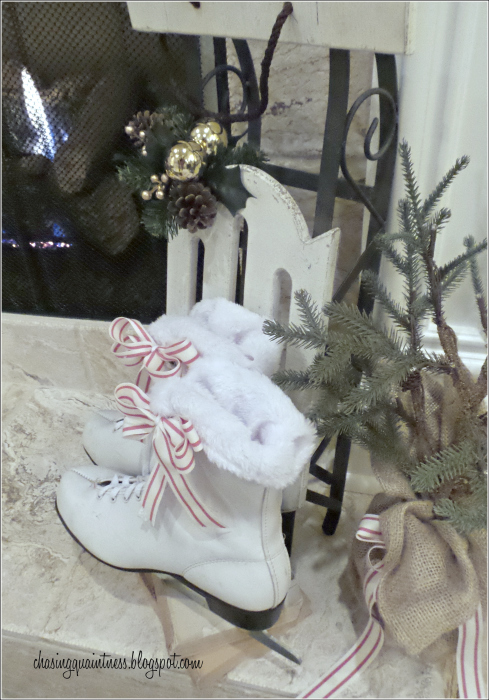 Love the skates, and I love how you added the faux fur trim, I have 'cut' up those stockings before for the trim too. Thank you so much! 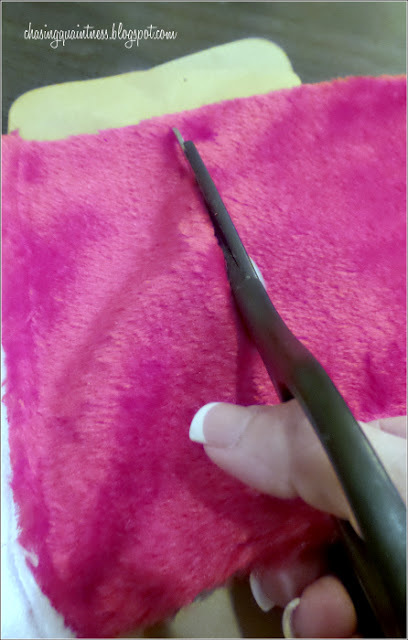 I would normally never think of this, but the idea just popped into my head when I was looking for craft fur at Michael’s…why not make life a little easier, right? And if a stocking or two gets sacrificed in the process, then that’s just the way it goes sometimes…LOL I like having some winter décor around after the holidays because everything looks so bare with the Christmas decorations packed away, so I’m glad I can transition these. Ummm….about the red part…..LOL. They were not well made and I had red fluff everywhere, so I threw them away…don’t hate me…LOL. I couldn’t think of another thing to do with all that crumbly material…LOL Hugs!! 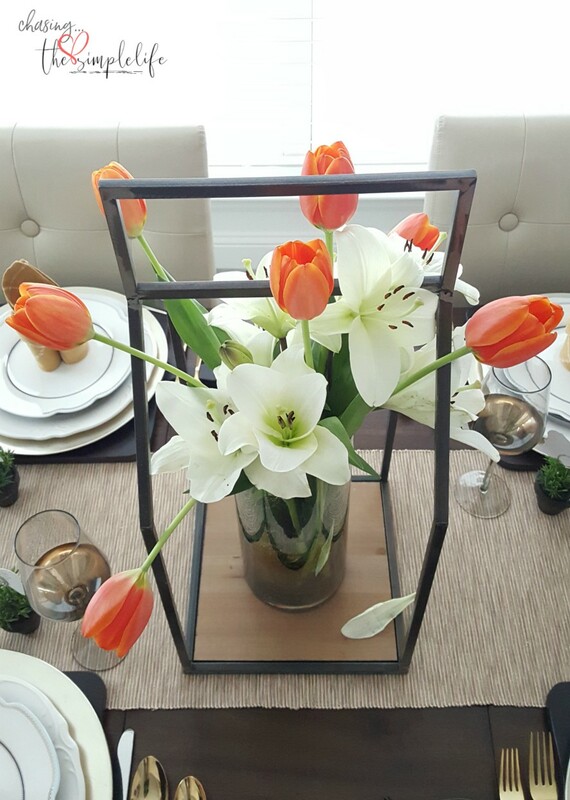 Hi Benita ~ these are fabulous! 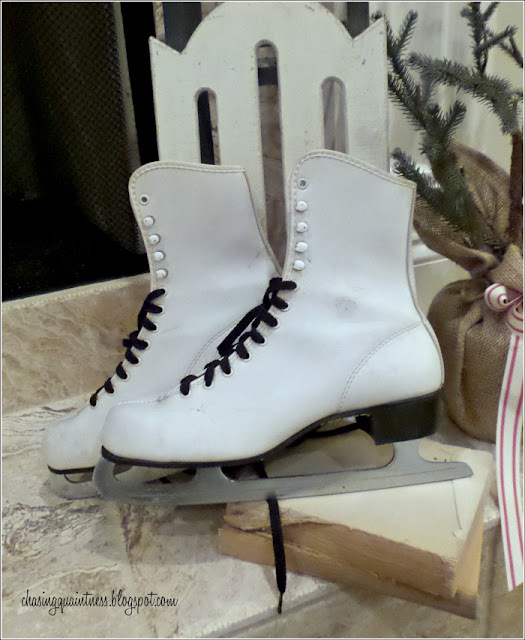 I love old ice skates and even though it is currently in the high 70s here, I have a pair by my door too ;) Merry, merry! Thank you so much! You must be having the same horrid winter weather we are…LOL. I’m so ready for the cool temps to settle back in! Hope you are having a great day! Hugs!